ATLANTA - Health officials released new guidelines Monday for how health workers should gear up to treat Ebola patients. 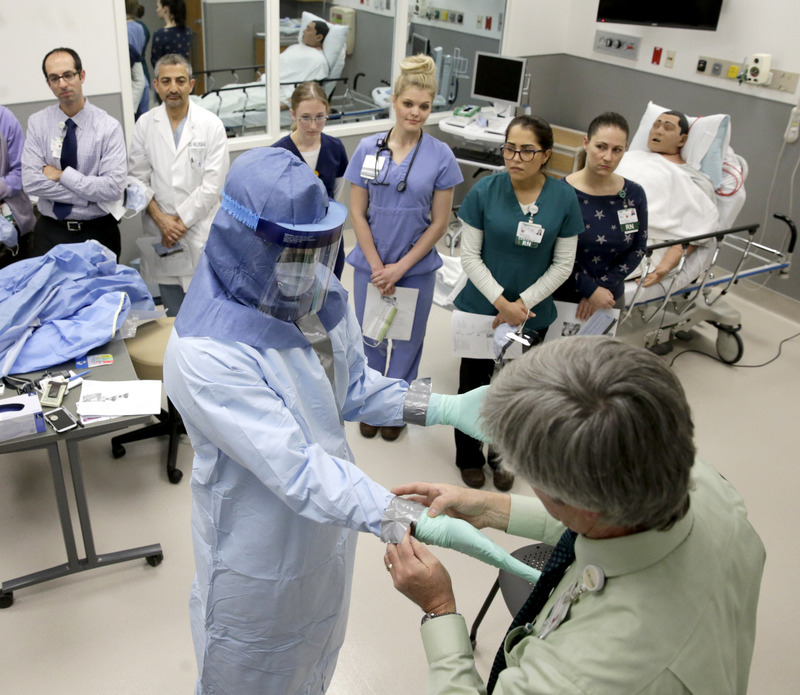 Experiences by medical staffers caring for Ebola patients at Emory University Hospital in Atlanta and the National Institutes of Health Clinical Center are reflected in the guidelines, the CDC said. CBS News chief medical correspondent Dr. Jon LaPook said that the stricter guidelines were determined by those experiences. "The CDC said, you know something, they didn't seem to work, we're going to make them more strict," said LaPook on CBS This Morning. Health workers had been pushing for the guidance since the nurses at Texas Health Presbyterian Hospital in Dallas were infected. They had treated an Ebola-infected patient named Thomas Eric Duncan - the first person diagnosed with the virus in the U.S.
"We may never know exactly how that happened, but the bottom line is, the guidelines didn't work for that hospital," Frieden said. -Use of protective garments, hoods, face shields, double gloves, face masks or respirators and other protective equipment to cover every square inch of a health worker's body. -A call for health workers who may be involved in an Ebola patient's care to practice repeatedly and demonstrate proficiency in donning and doffing gear before ever being allowed near a patient. -Placement of a trained hospital employee to supervise all aspects of care in an Ebola patient's room and watch that all health workers put on and take off gear correctly. Duncan's infection and subsequent death led to the monitoring of about 50 people who came in contact with him before he entered the hospital and dozens of health care workers who cared for him after his admission. Youngor Jallah spent the past three weeks confined to her small apartment with her children and boyfriend, fearing they had contracted the deadly Ebola virus from her mother's fiance. But with the household emerging symptom-free from the incubation period, Jallah's family members are now trying to resume their lives - replacing the personal belongings incinerated in a cleanup at her mother's home, and overcoming the stigma of the Ebola scare that has gripped Dallas. Jallah's fiance, Thomas Eric Duncan, was the first person diagnosed with Ebola in the U.S. He died Oct. 8. An Ebola patient who was being treated in Atlanta since early September was released from Emory University Hospital on Sunday after he was determined to be free of the virus and no threat to the public. Hospital and health officials never released his name, in keeping with his family's wish for privacy. After Duncan was diagnosed with Ebola, Troh, her 13-year-old son, Duncan's nephew and a family friend were ordered by a Dallas court to stay inside the apartment among Duncan's used linens. Five days later they were evacuated to a four-bedroom home in an isolated corner of a 13-acre gated property owned by the Roman Catholic Diocese of Dallas, southwest of downtown. The city of Dallas announced Monday it is coordinating with a local church and donors to provide Jallah's mother, Louise Troh, with funds to pay for six months of housing. Once she chooses a location, nonprofits will assist the family with furniture, linens and other household items, the city said. While health workers cleared Jallah of having Ebola, the disease's stigma lingers - including among fellow Liberians, she said. "If they see me at the store, they run away," she said.